Swaffham is a large parish situated in the Breckland Local Government District. It has an area of over 2900 hectares and is situated on the A47 around 50km west of Norwich. In 2001 it had a population of almost 7000 people. The name ‘Swaffham’ is thought to derive from the Old English words for Homestead of the Swabians. Objects from the earliest periods of human history have been recovered in numbers from the parish. The earliest of these are six Palaeolithic handaxes (NHER 2645, 2646 and 25686) and a Palaeolithic flint cleaver (NHER 4142). Slightly later is a Mesolithic flaked axehead (NHER 13339), but the majority of objects date to the Neolithic period and include four Neolithic axeheads (NHER 2652, 2653, 12884 and 29493), two knives (NHER 14919 and 14920), two scrapers (NHER 15349) an adze (NHER 2654), and a barbed and tanged arrowhead (NHER 14917) . Unfortunately no monuments from the prehistoric period survive today, although the site of a possible Bronze Age barrow (NHER 4555) has been recorded. The barrow itself has been destroyed, but a number of prehistoric flakes have been recovered from the area. However, a large number of Bronze Age objects have been retrieved. 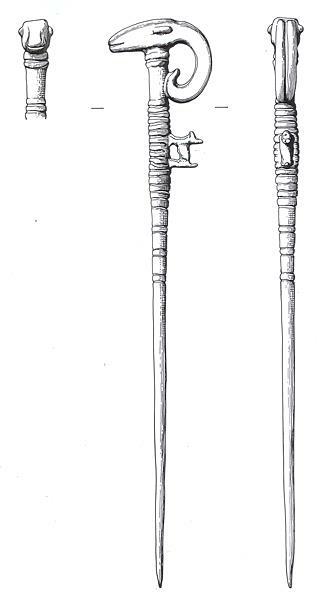 These comprise two flanged axeheads (NHER 2656 and 16097) and six socketed axeheads (NHER 2662, 2663, 11255 and 17404) as well as two spearheads (NHER 4143 and 17892), a palstave (NHER 2660), and a socketed gouge (NHER 2661). Of particular interest is a Middle Bronze Age hoard (NHER 2664) which was recovered in 1849 and comprised two spearheads, a chisel, a flanged axehead and a palstave. Another hoard, comprising four Bronze Age riveted rapier blades (NHER 4144) has also been found in this parish. Perhaps one of the most stunning objects recovered from the prehistoric period is a Late Bronze Age or Iron Age pin (NHER 37178), which not only has the head of a ram but is also decorated with a small dog figure attached to the stem of the pin. 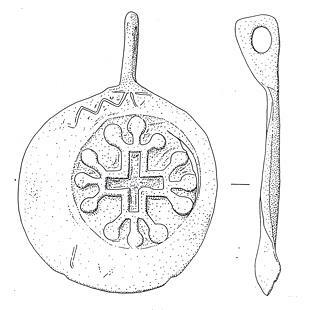 Other Iron Age objects comprise a gold stater coin (NHER 2666), a pottery sherd (NHER 4538) and an early brooch which is thought to date to the 5th to 3rd centuries BC. Evidence of Roman occupation is limited, although work on the route of the A47 bypass did record a number of Roman period pits or ditches (NHER 15346) which contained 1st to 4th century Roman pottery sherds and coins. However, a large number of objects have been recovered from over thirty individual sites across the parish. Artefacts recovered include a particularly interesting oval brooch with amethyst (NHER 2667), an intaglio ring (NHER 29209), fragments of a copper alloy bowl (NHER 2670) and plaque (NHER 2669), as well as pottery sherds (NHER 2677, 12856 and 28566). Coins from emperors such as Vespasian (NHER 2672), Commodus (NHER 14678), Septimus Severus (NHER 2653), and Constantine II (NHER 2675) have also been recovered, as well as a number of brooches (NHER 2668, 28213 and 28567). Occupation of this area continues into the Saxon period, from which two mixed inhumation and cremation cemeteries have been recorded. The location of the first, which is known to have contained a number of cremation urns and at least one inhumation (NHER 23883) is unknown, but the second was excavated in the 1970s. At this one (NHER 1125) a total of nineteen inhumations and one possible cremation were recovered, and of the skeletons recovered two showed signs of having received successful trepanations. The excavated graves also produced a number of grave goods which included a gilded cruciform brooch and necklace of amber beads from a woman’s grave and an iron spearhead and ferrule from a child’s grave. A small number of Saxon objects have also been recovered from other locations across the parish, and these comprise pottery sherds (NHER 2652, 12367 and 24182), four brooches (NHER 2680, 28567, 29212 and 29724) a pair of Late Saxon tweezers (NHER 28213), a Late Saxon stirrup mount (NHER 28588) and a coin of the Middle Saxon ruler Coenwulf (NHER 31824). It should also be noted that Swaffham was highly valued in the Domesday Book of 1086, in which at least one mill is mentioned. It is possible that this mill may have been on the site of a later medieval mill mound that survives to the present day (NHER 2655). 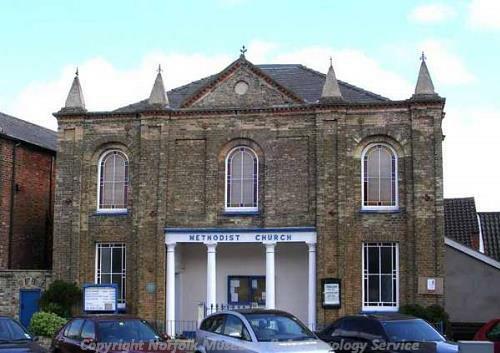 The existence of a chantry chapel (NHER 39463), a chapel to St Mary (NHER 14440), and a medieval monastic hospice (NHER 3977) are also known, but the earliest building to survive to the present day is SS Peter and Paul’s Church (NHER 2698). Some sections of the church date to the 14th century, but the majority of the structure is due to a number of building phases in the 14th and 15th century that saw the addition of a chancel, tower and north aisle. Other medieval sites include a number of pits (NHER 40197), ditches and post holes (NHER 36663) recorded in the parish, although the remains of a possible medieval house may survive as part of White Lodge (NHER 37599). The Greyhound Inn (NHER 34721) is perhaps the second oldest building in the parish, as it retains bridging beams and wall plates on the ground floor that have wave and hollow mouldings and are thought to date from around 1520. Medieval and post medieval objects have also been recorded. These include pottery sherds (NHER 2681, 15068 and 29723) and coins (NHER 29210, 29211 and 30822), as well as scatters of occupation debris (NHER 4146). Of particular interest are finds such as the fifteen post medieval clay lamps (NHER 17989) recovered from the ceiling of a house in the town, as well as a post medieval wooden shoe (NHER 13243) and an enamel and niello horse harness pendant (NHER 32086). A large number of post medieval buildings of architectural interest survive today, largely in the town of Swaffham itself. At the centre is the Butter Market Cross (NHER 2694), which was built in 1781 to 1783 for the Earl of Orford. Around this on three sides is the Market Place, which includes large numbers of interesting post medieval buildings, including the Assembly Rooms (NHER 13247). These were built between 1776 to 1778, with a four bay stuccoed south front added by William Newham in 1827. Swaffham town is particularly well endowed with buildings of architectural interest, with over thirty situated on the Market Place alone. These include Ceres Pharmacy (NHER 34712), the Kings Arms Public House (NHER 46431), and the Post Office (NHER 46435). Other roads of note include London Street, which has nineteen buildings of note such as The Hollies (NHER 23882), the Town Hall (NHER 34713), and the White Hart Inn (NHER 46461). Station Street, on which are the Baptist Chapel (NHER 31603), the White Lion Inn (NHER 34726), and the George Hotel (NHER 46427) is also of interest. From more recent history is the foundry of Plowright and Sons (NHER 2674), which was built around 1860 and contained three furnaces. Surviving evidence for other forms of industrial activity in the parish is rare, but the locations of a number of now destroyed kilns (NHER 2695), brick kilns (NHER 24305) lime kilns (NHER 2696, 4556, 16700 and 16701) and windmills (NHER 15243, 16700 and 16702) have been recorded. World War Two also left its mark on the parish. The sites of four pillboxes are recorded (NHER 32387, 32388, 32389 and 34451), and two pill boxes are known to survive (NHER 24471 and 24539). In addition the site of a possible bombing decoy has been identified (NHER 13607), and two spigot mortar emplacements have been found (NHER 34729 and 34730). http://en.wikipedia.org/w/index.php?title=Swaffham&oldid=142211204. Accessed: 9 July 2007.